Have you tried out TF2’s training mode? 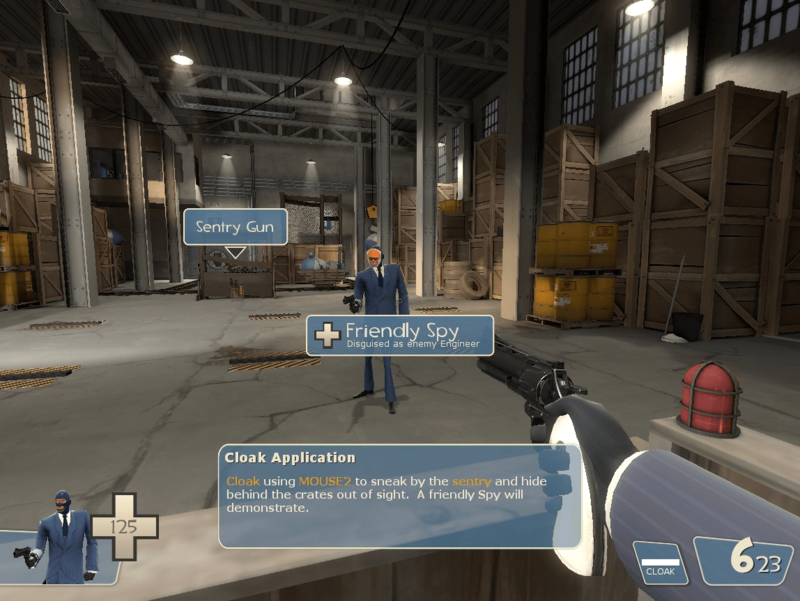 It was added back in June 2010 as a way to familiarize new players with the Soldier, Demoman, Spy, and Engineer. Even if you vaguely remember doing them back in your TF2 career, you should check them out again, because at some point in history my progress was reset. And good thing too, because I quickly learned that I needed spy training. He’s by far my worst class, I can usually average .05 kills per life after hours of playing him. I tried to sap a stickybomb once. Even lone buildings are a threat. So perhaps some training is just what the doctor ordered. But I can’t resist showing off how dapper he looks. Spy training is unlocked after Soldier and Demo training. Like Soldier and Demo, you begin trapped behind a chest-high wall which prevents you from visiting any other square foot of the map. Luckily, since spies rely heavily on their knife it’s the first training where you are given free range to roam tr_target. But let’s not get ahead of ourselves. Upon informing me as to how my invisibility watch worked, the game points out an enemy sentry hiding behind a fence and tells me that once my barrier lowers, I was to cloak and sneak past the sentry. It then sent a friendly spy to demonstrate for me. 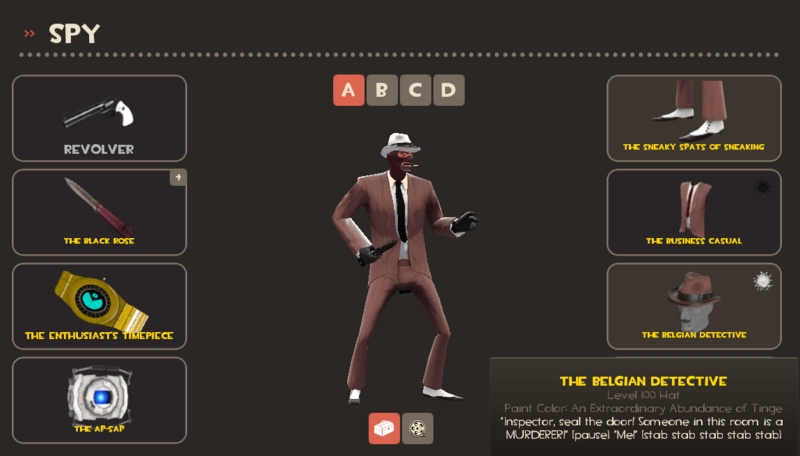 Feeling that I didn’t need someone to showcase this for me, I quickly kicked him by going to console and typing “tf_bot_kick “Friendly Spy“. Maybe I felt a little bad about doing this. He was just trying to help. This turned out to be a bad move, because the ‘friendly spy’ demonstration actually triggered the barrier lowering, meaning I was locked forever in the starting barrier, the same hell Soldier and Demo must endure. This put a hamper on my ability to sneak past the sentry on the other side of the map. But fear not! For what I lack in spy prowess I can compensate for with blatant cheating. A quick “sv_cheats 1” and “noclip” let me glide through the barrier like a ghost. (But not actually as a ghost, then I would have typed “addcond 77“). Now for the matter of that sentry. A quick note at this point that training mode locks you out of your Revolver for some reason. But to my delight I quickly found that using the quickswitch key (default Q) I could regain my revolver, as shown in the above picture. From here, I decided I would bypass that sentry in style, by gunning it down from afar with my trusty six-shooter. Take that, Soldier! (No really, it says the Sentry was built by Soldier. Really weird. )Then I strutted proudly to the indicated point, confident in my sentry-busting ability. It was then that things got a little weird. The game started asking me to backstab ‘the targets’, when there were no targets to backstab. 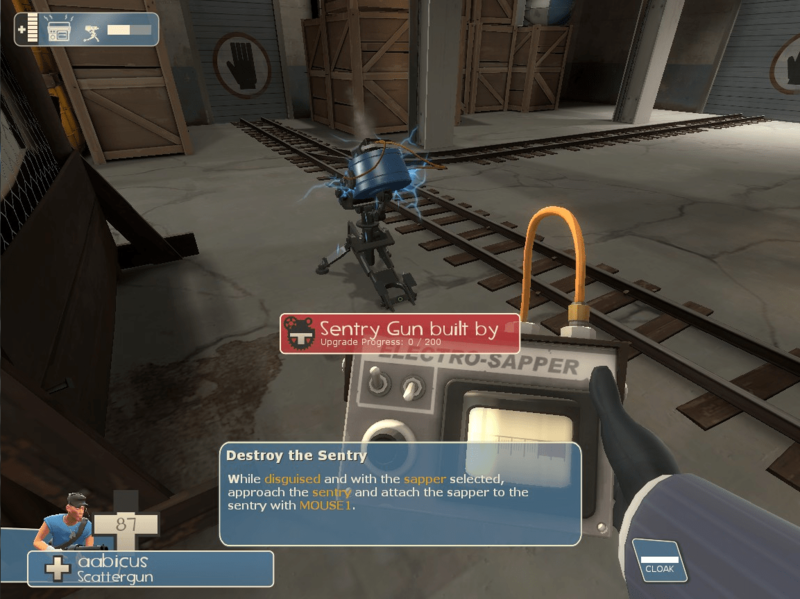 Immediately after that, it unlocked the use of my sapper and disguise kit and told me to go sap the sentry. This proved to be difficult to execute as I’d already destroyed it. I tried to Band-aid my mistake by spawning a new sentry with “ent_create obj_sentrygun“, but the training wasn’t having any of it. I couldn’t Kobayashi Maru my way out of this one; I am trapped in tr_target to this day. In order to make it RED-loyal I had to type “ent_fire !picker setteam 2”. And for some reason disguises no longer worked on it. And that’s how I failed spy training. I think there’s a lesson to be learned from this, but unless it’s “I should just play Soldier or Demoman” I’m not sure what it is. I could get the same glitch to happen, but with significantly less console commands. When the training first starts, you can switch to your revolver, so then I would shoot the sentry to death and then it would say “backstab the targets!” But of course I couldn’t.